The 31st edition of the Catalan Youth Culinary Contest was held on 24 April 2017 in Sant Pol de Mar at EUHT StPOl hospitality school. The event gathered nine participants from Catalonia and focused on the themes of market cuisine and local, seasonal products in order to promote sustainable gastronomy and cuisine. 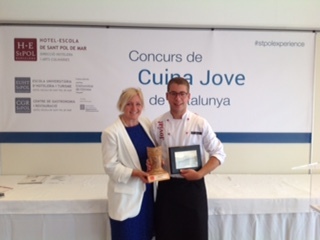 Pau Gabarró from the Culinary School Joviat obtained the first prize and will be the finalist representing Catalonia in the European Young Chef Award 2017, organised in November 2017 in Sant Pol de Mar, Barcelona.